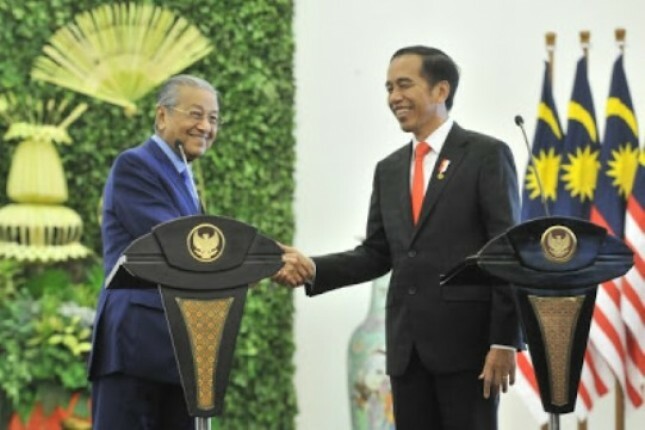 INDUSTRY.co.id - Bogor - President Joko Widodo and Malaysian Prime Minister Mahathir Muhammad during his visit to Indonesia where a limited meeting was held in Bogor Palace discussing governance issues, eradication of corruption, connectivity, border settlement and politics. According to the President, talks to cooperate and border, so the benefits will be obtained by Malaysia and Indonesia. Head of State also revealed that in meeting with PM Mahathir also entrusted to the protection for Indonesian workers who are in Malaysia. "Also the construction of schools for Indonesian children residing in Malaysia," said Jokowi. Related internationally, continued the President, Indonesia and Malaysia also have the same commitment that the settlement through dialogue based on international laws will be put forward. Prime Minister Mahathir hopes that friendship and cooperation between Indonesia and Malaysia can be increased due to its many advantages, both in politics, economics, and also international relations. "We face the same problem, for example oil exports, our palm oil exports are threatened by Europe, and we need to jointly fight them," Mahathir said. For that, Mahathir said, Indonesia-Malaysia need to jointly fight their campaign which says palm oil is made from forests harvested by entrepreneurs and with that they value badly on climate. "It's not true at all, we need a wide area for society and to get more and more results from the vast areas of our country," Mahathir said. The Malaysian prime minister also revealed that oil palm is competing with petroleum, so it is about economic and financial issues rather than environmental issues. Related to the educational issues of the children of the migrant workers, the Malaysian Prime Minister promised to guarantee his education. "Their children need to be educated and go to school, there are already some schools in our peninsular, but in Sabah Sarawak there are no schools for Indonesian children to live in. We will fix this," he said. Promises Mahathir. As for border issues, Mahathir also agrees with an approach to resolve the overlapping issue of Malaysia and Indonesia. "We decide on this issue, it cannot be alone, but the approach we have done We need to accept that there is cooperation between Indonesia and Malaysia, as Malaysia is working with Thailand where we have joint development area," Mahathir said. Mahathir also reveals President Jokowi's visit in 2015 and related to the possibility of building a Malaysian-Indonesian train that may be used throughout ASEAN. "For certain reasons, we cannot continue, but right now we have the right to continue," Mahathir said. The Malaysian Prime Minister also revealed that Indonesia and Malaysia have similar problems with domestic political issues. "We are also talking about our domestic politics, the problems faced in Indonesia are bigger than Malaysia, just the same kind I see, and we are talking about our ways of dealing with political problems in this democracy," Mahathir said.